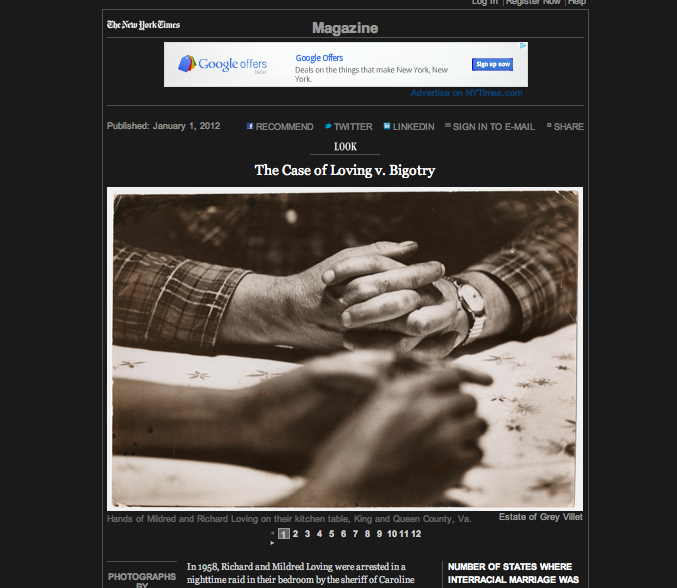 Their particular choice of photograph is also the perfect opportunity to give a very special thanks to Barbara Villet for her beautifully written piece about her late husband, Grey Villet, and the story behind his photography of the Loving family. We encourage you to read her essay as it adds another intimate layer to the deeply moving photography. We knew the date was approaching, we knew it was happening, but it still gives us chills to see the official trailer. We are honored to begin 2012 with a beautiful feature spread in this week’s New York Times Magazine. 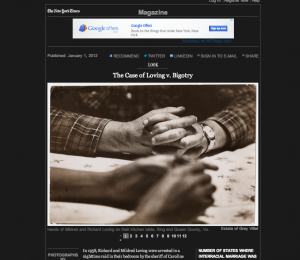 The piece walks through 12 images (taken by LIFE Photographer Grey Villet) of the Loving Family and quietly captures the love and bond between Richard, Mildred, and their children. Thank you to everyone for an amazing 2011 and we look forward to an exciting year ahead. Screenings on Sunday January 8th at 8pm and Monday January 9th and 5pm. You can purchase tickets here. Tuesday January 10th at 7pm. For more information, click here. Tuesday January 17th in Washington, DC. Please help us spread the word and check back shortly for an additional list of updates and screenings. - USA Today published an article about the rise of interracial marriages, and the challenges many families still face. Amy Wise, one of the women featured in the article, has a wonderful blog you can read here. - Duke University has been collecting oral histories of Jim Crow south with deeply moving (and often disturbing) accounts of life not too long ago, featured recently on NPR. Be sure to join us on Facebook, where you can see these updates in real-time as well as the subsequent conversations sparking from fellow Loving Story supporters.